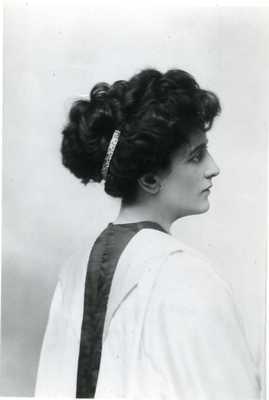 A black and white photograph in the Diana Forbes-Robertson collection on her aunt, Maxine Elliott, an internationally renowned actress born in Rockland, Maine in 1868. The only word written in pencil on the back of this photograph appears to say, "eye." Stamped John R. Freeman & Co, photographers, London, numbered 91307.